Scunthorpe United controversially secured a Carling Cup victory over seven-man Swansea City in farcical circumstances at the Liberty Stadium. Niall Canavan's goal in his first start gave Scunthorpe an early lead before Stephen Dobbie levelled with 12 minutes to go to send the tie into extra-time. Garry Monk was sent off in the 85th minute before Dobbie went off injured. Gary Hooper's late penalty gave the visitors the win before Gorka Pintado and Angel Rangel were also dismissed. The chaotic finale was completely out of character for a second-round tie that barely set the pulses racing until the final quarter-of-an-hour. Swansea had enjoyed greater territory and possession but the Welsh club could not find the killer touch in front of goal - and Dobbie feared it would not be his night when his 75th minute shot clipped the woodwork. Dobbie's persistence, though, paid off as he dashed onto Marcos Painter's pass before smashing the ball past Scunthorpe keeper Joe Murphy in the 78th minute to continue his Carling Cup love affair with his third goal in two ties. Paulo Sousa's side were clearly in the ascendancy but captain Monk's dismissal with five minutes remaining in normal time gave Scunthorpe faint hope and changed the tone of the whole game. Referee James Linington, who started to take centre stage, consulted with his assistant before awarding Monk the fifth red card of his career for violent conduct on Scunthorpe sub Michael O'Connor. Spanish striker Gorka Pintado, though, should have given the Swans a normal time lead three minutes into injury time but his effort was somehow superbly saved by Iron keeper Joe Murphy. As if Swansea's task with ten men was not difficult enough, Sousa's men were reduced to nine-men in extra time when goal-scorer Dobbie was forced off with a rib injury - and Swans boss Paulo Sousa had used all of his substitutes. Linington then awarded the visitors a harsh penalty with ten minutes remaining as he adjudged Alan Tate had handled the ball. Scunthorpe striker Hooper fired his third goal of the season into the roof of the net from the penalty spot. Swansea were reduced to eight men when Pintado was sent off after picking up a second yellow card for a challenge on Michael O'Connor. Then his fellow countryman Angel Rangel followed just a minute later when the Spanish full-back was dismissed for seemingly elbowing Matthew Sparrow. Tempers erupted in the dug-outs as Swansea and Scunthorpe's benches clashed as debutant Besian Idrizaj was fouled and was forced off. Football League rules state each side must have at least seven players on the pitch for a game to be played so with Swansea down to six men, Isle of Wight official Linington was considering abandoning this footballing farce with two minutes remaining. 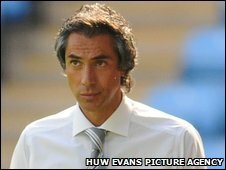 The farce descended to new depths when Swans boss Paulo Sousa had to send the injured Idrizaj back on to the pitch despite his inability to take part just so this crazy cup tie could have a conclusion. "There were very bad events that happened. Of course I don't appreciate it. I appreciate football completely different without the things. But I don't like to speak about this as we have ways to do this. "However, we talk about how it is important to try and protect and players and when it doesn't happen and when it changes situations and when players are being provoked it is difficult. "But of course they can't react like that, they have to keep focus and be alive to play our football. But it is not easy for the players who are doing the right thing when from the beginning they are being provoked. "We have our opportunity to write to the FA about the referee's performance but at this moment we do not know what offences the players have committed. "I never wanted the match abandoned but Idrizaj should not have gone back on the field but as we were then down to only six players the referee put pressure on us to get him back on." "It is the first time in 21 years that we have reached the next round of the Carling Cup. "Swansea's lack of discipline has cost them dearly as they are an excellent side. They are a fantastic passing team and we are really pleased that we defended well against them. "The discipline of my players was also very pleasing and the referee had no choice but to send their players off as they seemed to lose their composure." 120:00+2:31 The whistle goes and the game ends after extra time. 119:10 Leon Britton fouled by Gary Hooper, the ref awards a free kick. Free kick taken by David Cornell. 116:16 Sent off The referee shows Angel Rangel a red card. 115:10 Sent off Gorka Pintado sent from the field by the ref for second bookable offence. 114:53 Paul Hayes fouled by Gorka Pintado, the ref awards a free kick. Marcus Williams restarts play with the free kick. 114:00 Corner taken short by Josh Wright. 112:08 Shot from deep inside the area by Besian Idrizaj clears the crossbar. 110:52 GOAL - Gary Hooper:Swansea 1 - 2 Scunthorpe Gary Hooper scores a power penalty. Swansea 1-2 Scunthorpe. 109:42 Booking Alan Tate goes into the book for unsporting behaviour. 108:38 Outswinging corner taken from the right by-line by Josh Wright, right-footed shot by Paul Hayes. 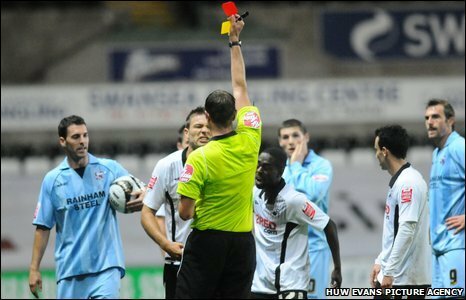 Alan Tate is penalised for handball and concedes a . 107:08 Booking Booking for Gorka Pintado for unsporting behaviour. 106:49 Gorka Pintado gives away a free kick for an unfair challenge on David Mirfin. Free kick taken by Joe Murphy. 106:18 Paul Hayes has an effort at goal from deep inside the area missing to the left of the target. 105:03 Inswinging corner taken right-footed by Josh Wright, Paul Hayes takes a shot. Save made by David Cornell. 105:00+1:52 Foul by Gorka Pintado on Michael O'Connor, free kick awarded. Jordan Spence restarts play with the free kick. 105:00+0:47 Foul by David Mirfin on Gorka Pintado, free kick awarded. Mark Gower has an effort direct from the free kick. 103:41 Booking Caution for Nathan Dyer. 103:30 Nathan Dyer concedes a free kick for a foul on Garry Thompson. Josh Wright restarts play with the free kick. 101:14 Mark Gower fouled by Gary Hooper, the ref awards a free kick. Free kick taken by Marcos Painter. 100:52 The offside flag is raised against Besian Idrizaj. Joe Murphy takes the indirect free kick. 99:32 The assistant referee signals for offside against Besian Idrizaj. Free kick taken by Joe Murphy. 97:32 Free kick awarded for an unfair challenge on Stephen Dobbie by Josh Wright. Mark Gower takes the free kick, Shot by Besian Idrizaj. Save by Joe Murphy. 95:39 Gorka Pintado has an effort at goal from 18 yards. Save by Joe Murphy. 93:43 The offside flag is raised against Gary Hooper. David Cornell takes the free kick. 92:54 Garry Thompson takes a shot from just outside the penalty area which clears the crossbar. 91:57 Booking Matthew Sparrow receives a yellow card for unsporting behaviour. 91:47 Foul by Matthew Sparrow on Leon Britton, free kick awarded. Marcos Painter takes the free kick. 91:04 Shot by Mark Gower. Joe Murphy makes a save. 90:00+4:18 The referee blows for the end of normal time. 90:00+3:34 Niall Canavan fouled by Gorka Pintado, the ref awards a free kick. Joe Murphy takes the free kick. 90:00+2:52 Gorka Pintado takes a shot. Save made by Joe Murphy. 88:18 Besian Idrizaj takes a shot from 20 yards. Save by Joe Murphy. 87:34 Alan Tate fouled by Gary Hooper, the ref awards a free kick. Direct free kick taken by Alan Tate. 87:14 Gorka Pintado is caught offside. Joe Murphy takes the indirect free kick. 86:23 Substitution Gary Hooper comes on in place of Sam Togwell. 85:23 Sent off The referee red cards Garry Monk for violent conduct. 82:11 Michael O'Connor concedes a free kick for a foul on Leon Britton. Marcos Painter restarts play with the free kick. 81:07 Inswinging corner taken right-footed by Mark Gower played to the near post, Jordan Spence manages to make a clearance. 78:06 Marcos Painter provided the assist for the goal. 78:06 GOAL - Stephen Dobbie:Swansea 1 - 1 Scunthorpe A goal is scored by Stephen Dobbie from just outside the area to the bottom right corner of the goal. Swansea 1-1 Scunthorpe. 76:32 Substitution Besian Idrizaj comes on in place of Jordi Lopez. 76:32 Angel Rangel is caught offside. Free kick taken by Joe Murphy. 76:09 Free kick awarded for an unfair challenge on Leon Britton by Michael O'Connor. Direct free kick taken by Leon Britton. 74:57 Substitution Garry Thompson replaces Martyn Woolford. 74:57 Stephen Dobbie has a drilled shot. 74:35 Nathan Dyer fouled by Martyn Woolford, the ref awards a free kick. Direct free kick taken by Angel Rangel. 73:12 Free kick awarded for a foul by Nathan Dyer on Martyn Woolford. Joe Murphy takes the direct free kick. 70:41 Leon Britton is penalised for a handball. David Mirfin takes the free kick. Inswinging corner taken right-footed by Josh Wright played to the near post, clearance made by Stephen Dobbie. 67:53 Free kick awarded for a foul by Stephen Dobbie on Martyn Woolford. Direct free kick taken by David Mirfin. 67:35 Jordi Lopez produces a cross, save by Joe Murphy. 66:56 Corner taken by Jordi Lopez from the left by-line, David Mirfin makes a clearance. 63:04 Substitution Michael O'Connor joins the action as a substitute, replacing Jonathan Forte. 63:04 Matthew Sparrow takes a shot from just outside the penalty area which clears the crossbar. 60:49 Free kick awarded for an unfair challenge on Leon Britton by Jonathan Forte. Alan Tate takes the free kick. 60:13 Mark Gower gives away a free kick for an unfair challenge on Jordan Spence. Direct free kick taken by Joe Murphy. 59:28 Substitution Mark Gower on for Kerry Morgan. 58:36 The assistant referee flags for offside against Gorka Pintado. Niall Canavan takes the indirect free kick. 55:25 Effort on goal by Nathan Dyer from just inside the penalty area goes over the target. 54:40 Inswinging corner taken by Jordi Lopez from the left by-line, clearance made by Jordan Spence. 52:51 Angel Rangel has an effort at goal from long range that misses to the right of the target. 51:11 Stephen Dobbie takes a shot. Sam Togwell gets a block in. Jordi Lopez decides to take a short corner. 48:33 Effort from deep inside the area by Stephen Dobbie misses to the left of the target. 47:50 Shot by Nathan Dyer from 18 yards. Marcus Williams gets a block in. Corner taken by Jordi Lopez played to the near post, save made by Joe Murphy. 46:37 The assistant referee signals for offside against Paul Hayes. David Cornell takes the indirect free kick. 45:28 Unfair challenge on Gorka Pintado by Marcus Williams results in a free kick. Free kick crossed by Marcos Painter, clearance by Paul Hayes. 45:01 Substitution Stephen Dobbie comes on in place of Chad Bond. 45:00+2:00 The first half comes to an end. 45:00+1:19 Alan Tate has a shot on goal from outside the box which misses right. 45:00+0:34 Jonathan Forte concedes a free kick for a foul on Alan Tate. Free kick taken by Marcos Painter. 44:20 Corner taken right-footed by Jordi Lopez, clearance by Paul Hayes. 43:15 The offside flag is raised against Angel Rangel. Joe Murphy restarts play with the free kick. 42:40 Jordan Spence concedes a free kick for a foul on Chad Bond. Direct free kick taken by Jordi Lopez. 37:55 Shot by Gorka Pintado from deep inside the penalty area misses to the left of the target. 36:11 Jordi Lopez takes the inswinging corner, save by Joe Murphy. Corner taken by Jordi Lopez from the right by-line played to the near post, Josh Wright manages to make a clearance. 35:37 Kerry Morgan has an effort at goal from 18 yards. Save by Joe Murphy. 34:42 Corner taken right-footed by Jordi Lopez from the right by-line, Garry Monk concedes a free kick for a foul on David Mirfin. Direct free kick taken by Joe Murphy. 34:33 Angel Rangel produces a cross, clearance made by Niall Canavan. 29:53 Martyn Woolford takes a shot. David Cornell makes a save. Corner taken right-footed by Josh Wright from the right by-line to the near post, free kick awarded for a foul by David Mirfin on David Cornell. David Cornell restarts play with the free kick. 28:11 Free kick awarded for an unfair challenge on Leon Britton by Sam Togwell. Garry Monk takes the free kick. 25:59 Drilled left-footed shot by Jordi Lopez. Save by Joe Murphy. 25:19 Paul Hayes gives away a free kick for an unfair challenge on Alan Tate. Free kick taken by Alan Tate. 23:44 Jonathan Forte has an effort at goal. Blocked by Alan Tate. 19:50 Kerry Morgan produces a right-footed shot from outside the penalty box and misses wide left of the target. 17:30 Jordi Lopez fouled by Jonathan Forte, the ref awards a free kick. Free kick taken by Angel Rangel. 16:41 Martyn Woolford has an effort at goal from just outside the penalty box which goes wide of the left-hand post. 15:53 Unfair challenge on David Mirfin by Gorka Pintado results in a free kick. Joe Murphy takes the direct free kick. 14:35 Booking Booking for Jonathan Forte for unsporting behaviour. 14:20 Foul by Jonathan Forte on Marcos Painter, free kick awarded. Direct free kick taken by Marcos Painter. Correction - 12:44 GOAL - Niall Canavan:Swansea 0 - 1 Scunthorpe Niall Canavan grabs a headed goal from close in. Swansea 0-1 Scunthorpe. Correction - 12:44 The assist for the goal came from Josh Wright. 12:44 Assist on the goal came from Jonathan Forte. 12:44 GOAL - Jordan Spence:Swansea 0 - 1 Scunthorpe Jordan Spence grabs a headed goal from close in. Swansea 0-1 Scunthorpe. 10:09 Chad Bond takes a outswinging corner to the near post, Garry Monk takes a shot. Save by Joe Murphy. Corner taken right-footed by Chad Bond, Matthew Sparrow manages to make a clearance. 7:27 Jordan Spence gives away a free kick for an unfair challenge on Kerry Morgan. Marcos Painter takes the direct free kick.